There are probably several million articles on the internet about how to grow tomatoes. 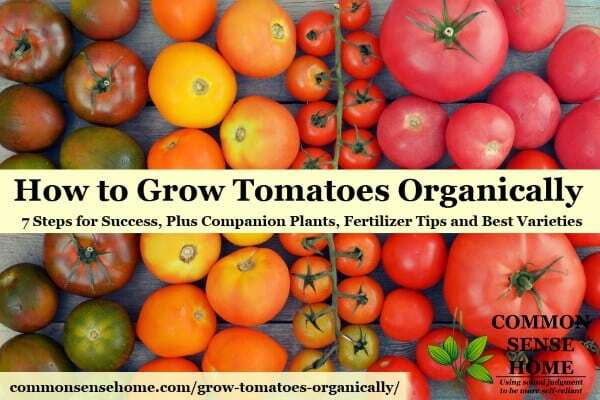 Folks will tell you how to grow tomatoes organically, or how to grow world record tomatoes, or how to grow 60-80 pounds of tomatoes from a single plant, or how to grow the tastiest tomatoes. We have a love affair with our tomatoes. Tomatoes are the most commonly grown plant in home gardens – and with good reason. That first taste of a perfectly ripe, fresh off the vine, sun-warmed tomato is pure awesomeness! Even if you're not sure about fresh tomatoes on their own, homemade spaghetti sauce, salsa and ketchup may make you a believer. Based on advice from my friends, I'm going to break this post into two sections – Beginner on page one and Tomato Whisperer Guru Ninja Level on page two. 1. Prepare garden bed or container. Pick a spot with a minimum of 5 hours of sun. More is better. Work up soil, add some compost or rotten manure. Tomatoes are hungry beasts. 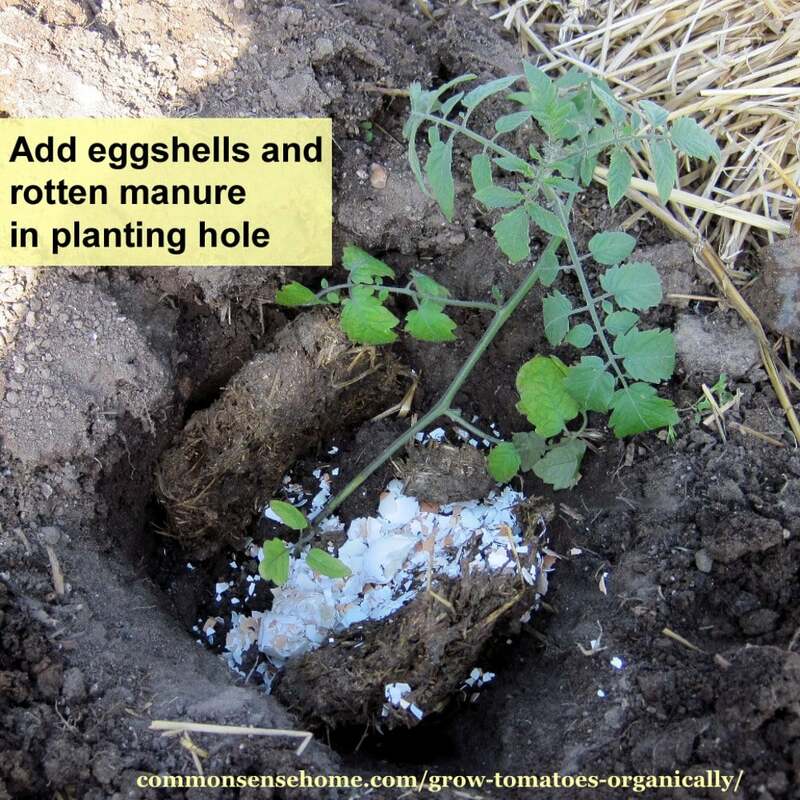 Add a handful of crushed eggshells or 1/4 cup diatomaceous earth to planting area. This adds calcium to help prevent blossom end rot (but will not eliminate it). If you have room in your garden, practice crop rotation and don't grow tomatoes and related plants (peppers, eggplant, potatoes, tomatillos, ground cherries, etc) in the same ground for two years in a row. 2. Buy or grow healthy tomato plants. Avoid big plants in tiny pots, and long, leggy plants. They are probably root bound (too many roots in not enough space). This causes stress to the plant. If you would like to grow your own tomato transplants, check out tomato seed starting basics. Determinate tomato varieties will grow to a certain size and stop, and tend to ripen all their fruit around the same time. Indeterminate varieties (most heirlooms) will keep growing until frost and ripen fruits over a longer time period. 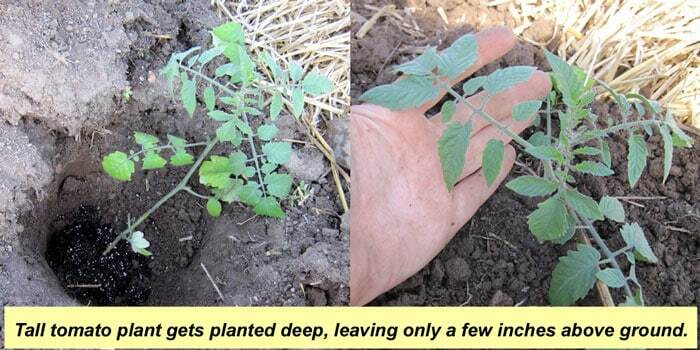 Tomatoes will not tolerate frost (it will kill them), so don't rush to get them in the ground. Dig a deep planting hole or a trench. Loosen any tangled roots as you gently remove the seedling from its pot. 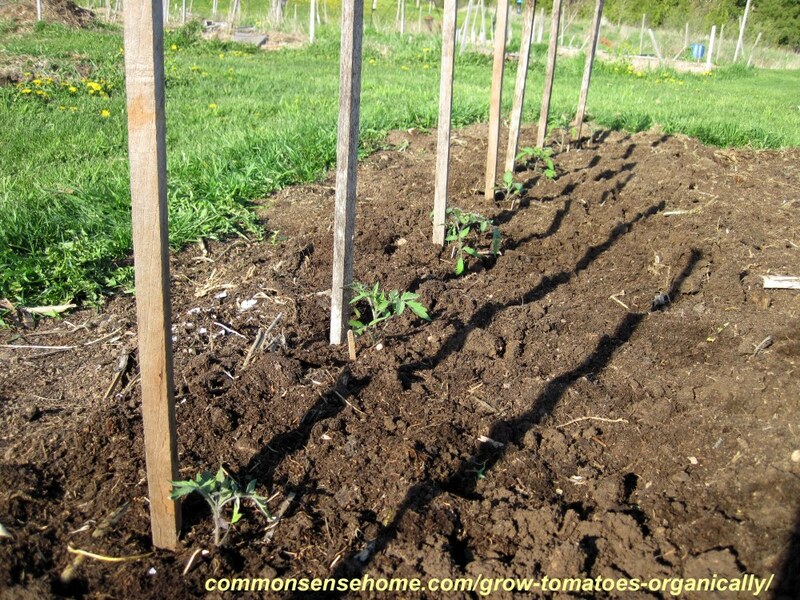 Either plant the tomato deep into the ground, or lay it into a trench so that only 3-4 inches of the tomato plant is visible above ground. 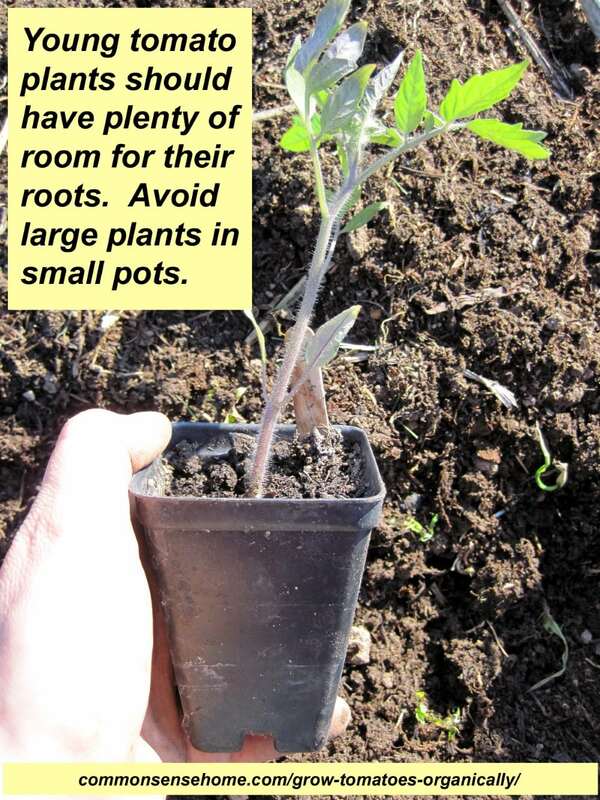 The tomato will send out new roots from the buried plant, and less plant above ground will make it less prone to wind damage. I tell the boys to start digging to China when we get planting. If there are leaves that will be buried, you can nip them off with a scissors or garden clippers if you like – never rip or tear. 4. Add supports (or don't). Put up a trellis or tomato cage to support plants as they grow when you first plant your tomatoes, to avoid root damage later on. Make sure whatever you use is well secured. High winds can destroy a tomato patch. Trellising will generally improve light exposure and air circulation, yielding healthier tomatoes. If you don't want to bother trellising, just let your tomatoes sprawl on the ground. They will still grow. The patch will just be messier. Mouse and slug damage will also be more likely, and the tomatoes may get a little dirtier. I like trellises, I have two close friends who usually don't bother with them. One of these friends grows several hundred pounds of tomatoes per year. We have strong winds here, and I've always found tomato cages make it hard for me to access the fruit. My preferred option is three 4 foot stakes per tomato plant, plus an overhead trellis. 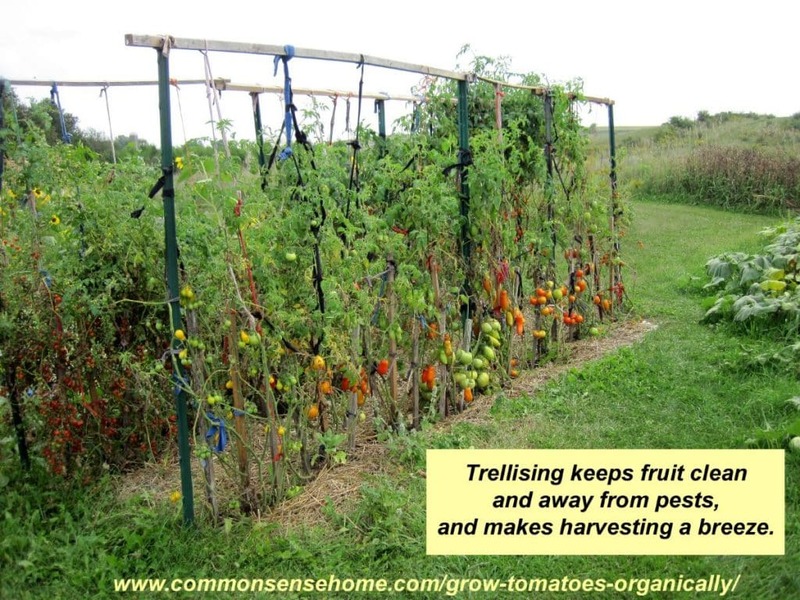 You can read about my system, as well as several other trellis options, in the post “5+ Terrific Tomato Trellis Ideas for Easier Picking and Cleaner Tomatoes“. 5. Add mulch (or don't). Again, this is a matter of personal preference. I like to lay down wet newspaper and cover with straw after the tomato plants are well established. If it's a cold year and I want extra heat, I'll put down black landscape fabric over this. I get cleaner tomatoes, more even soil temperature and moisture, and very few weeds. My friends who skip tomato supports often skip mulching, too. Some folks use black or red plastic mulch. 6. Make sure they get enough water. Tomatoes need about an inch of rain or equivalent per week. Lack of water, too much water or irregular watering can cause blossom end rot (black rot starting at the blossom end of the tomato) and cracking. If this happens in your garden, don't freak out. It's not contagious. Just remove the damaged fruit and pay more attention to watering. Note: Blossom end rot may also indicate a lack of available calcium in the soil. (Moisture extremes make this more obvious.) 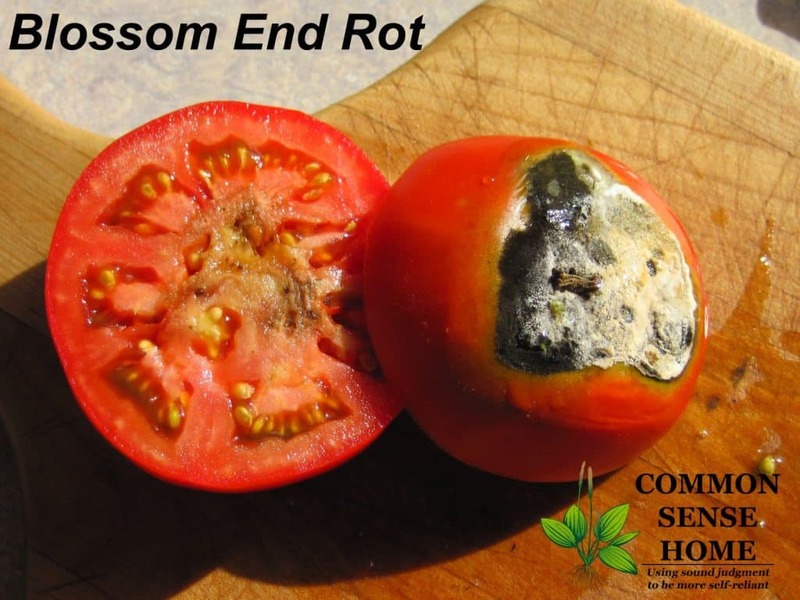 For more on blossom end rot, check out “7 Steps to Stop Blossom End Rot & Get Rid of Black Bottomed Tomatoes“. 7. Keep weeds from going crazy. I don't mind a few weeds. Many are useful for food and medicine, so I let them grow here and there. I just don't let them take over or seed out. If you don't mulch, shallow cultivation such as running a scuffle hoe through the first couple inches of soil to nab weeks when they are tiny and break up soil crust is better than running a heavy tiller through your patch once weeds get huge. Odds are large weeds will come right back after tilling, and/or you'll bring new weed seeds to the surface. Many weed seeds last for decades in the soil, so I limit deep tilling to keep most of them waiting patiently underground. 8. Enjoy your homegrown tomatoes! 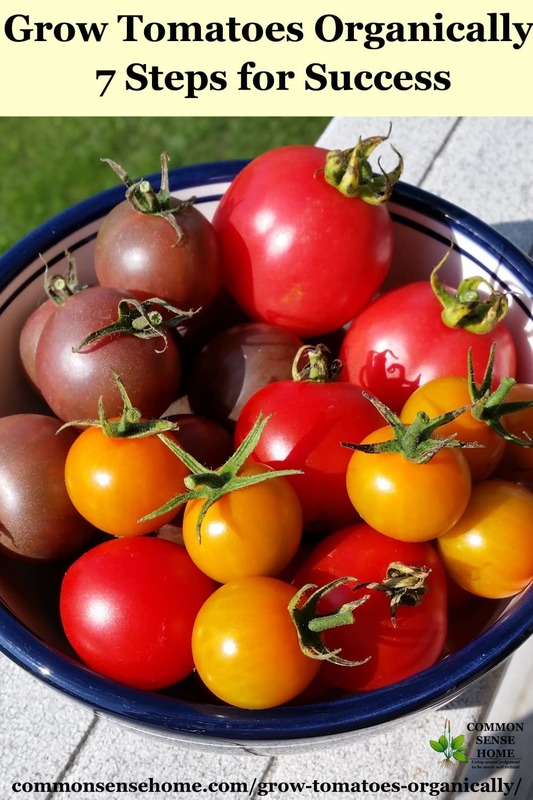 Once your tomatoes turn red (or pink or purple or yellow or striped or any of the other funky colors that heirloom tomatoes can be), remove them from the vine and enjoy. Don't rip or tear the stems when picking – this stresses the plant and opens the path for disease and insect damage. Most tomatoes will have a little knob in their stems, about 1/4 to 1/2 inch above the tomato, where the stem will snap easily in two, releasing the tomato from the plant. I usually skip pulling the stem off until I'm ready to use the tomato, because sometimes pulling the stem off leaves a big old hole instead of a tiny mark.